Many supermoto and dual sport bikes come from the factory with a speedometer that is off by a considerable amount. Additionally, if you change your WR250X's gearing, it will throw off both the speedometer and odometer. Today I got my white plastics installed... everything except for the rear fender (just left the black one on). Got my new WR250X retro tank graphics in Red/Black/White installed. I applied the vinyl graphics to a pair of WHITE tank shrouds, and they look great. They would also work well if you have BLACK tank shrouds. I've got my black OEM plastics on for now, but I have a set of white plastics I will be putting on soon to see how that looks. I decided it was time to get a GPS for my WR250X. I have a Garmin Nuvi 765T in my car, which works great, but wanted something a bit more worthy of outdoor use for the motorcycle. I'm about 5'9" tall with a 32" inseam, so the WR250X is a bit tall for me. I'm on my tip toes with the stock seat so I wanted to try and lower the seat height without lowering the suspension. I thought an aftermarket seat might help and the Spiral Step Seat worked out perfectly. It lowers the overall seat height by about 1" and has a black gripper seat cover. I've put about 1500 miles on the seat so far and find it more comfortable than the stock seat, and now pulling up to stop lights and stop signs is not as much of a challenge. Installation was a breeze... it bolts right up to the stock seat mount in about 30 seconds and the fit/finish is just as nice as the stock seat. Since I still have the stock handlebars on my WR250X, I decided to go with Acerbis Rally Pro X-Strong Handguards . I had read these guards fit the stock bars really well. That turned out to be exactly the case and I got them installed without any problems. I've heard some of the other handguards, like the Cycra brand, can be difficult to get to work properly with the stock bars... specifically they are always loose at one of the pivot points. That isn't the case with the Acerbis and they fit perfectly. Also shown is the Wolfman Enduro X-Carry-All Bag I bought to carry stuff around in. The bag is small, but it's the perfect size to fit my wallet, camera, and cell phone. I also carry a couple small tools in it. Installation was pretty simple and took me about an hour and a half. The OEM connectors are nice because once you install them on the wires for the tail light and turn signals, you can just plug them right into the connectors already on the bike. It makes for a nice plug-n-play installation. On the Edge tail light, all LED's come on as a running light, then all get brighter when the brakes are applied. License plate illumination is provided by 3 white LED's on bottom of the tail light. 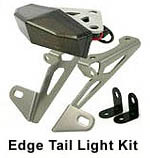 The Edge kit does not come with turn signals, so I bought the DRC Type 601 LED flashers which bolt directly to the Edge tail light bracket. Here are the before and after photos. Notice how nice and small the final product is... a huge improvement over the enormous ugly stock rear tail light and turn signals.